1991 Mitsubishi 2512HB2 CNC Laser Contour Machine w/ Mitsubishi LC10B Controls, Resonator Rebuilt in 2011, 4’ x 8’ Sheet Cap., Mitsubishi ML3016F 1.6 kW / 3.0 kW Peak Laser Package s/n 113016F035,Slug Conveyor, Cooling Tower. Amada VELA II 305050 30 Ton CNC Turret Punch Press s/n AV550014 w/ Amada-Fanuc-V Controls, 40-Station Thin Turret, 50” x 50” Sheet Cap., Manual Sheet Repositioner, 50” x 100” Ball Top Table. Amada SPH-30 30 Ton NC Punch Press s/n 309156 w/ Amadan-SS System II Controls, Amadan-SS 104 Slide System, 3.94” Stroke, 3-Punch Head, 16” Brake Press Head, 16” x 22” Bolster Area. Strippit Super 30/30 Fabricator 30 Ton Punch Press s/n 7852-880 w/ Trak DRO, Duplicator Attachment, Fence System, 3 ½” and 1 ¼” Punch Heads. Rousselle No. 6A 60 Ton OBI Stamping Press s/n 26572 w/ 110 Strokes/Min, 3” Stroke, 3 ½” Slide Adj., 12½” Shut Height, Air Clutch, 18” x 30” Bolster Area. V & O “Super” 35 Ton OBI Stamping Press s/n 35ST-244 w/ 150-450 Strokes/Min, 2” Stroke, 3” Slide Adj., Air Clutch, Air Cushion, 16” x 29” Bolster Area, Link-Logic Brake Monitor. 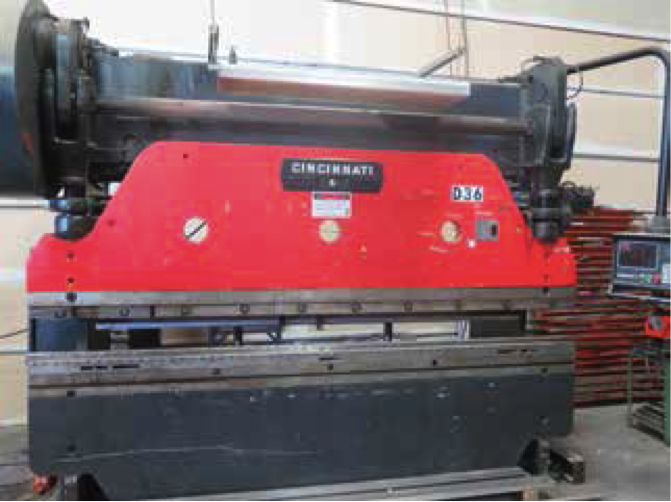 Cincinnati 5-Series 90 Ton x 8’ CNC Press Brake s/n 34471 w/ Hurco Autobend-7 Controls and Back Gaging, 133 Ton Near Bottom of Stroke, 10’ Bed Length, 3” Stroke, 8 ¼” Throat, 103” Between Uprights. Gaging, 10’ Bed Length, 8” Throat, 102 ½” Between Uprights. DiAcro 14-72 35 Ton x 6’ Hydra-Power Press Brake s/n 6600877324 w/ Manual Dial Back Gage, 6’ Beg Length, 9” Throat, 64” Between Uprights. Amada M-1232 48” x 1/8” Power Shear s/n 1230909 w/ Amada Controls and Back Gaging, 43” Squaring Arm, 28 ½” Front Support, 70 Strokes/Min. Wysong 6’ Power Shear w/n Dial Back Gage. Wysong mdl. 1636 36” x 16GA Foot Shear s/n F03-1933 w/ Manual Back Gage. Amada CS-220 8 5/8” x 8 5/8” Hydraulic Corner Notcher s/n 543646 w/ Fence System. Edwards “JAWS IV” 55 Ton Iron Worker w/ ½” x 12” – 3/8” x 14” Flat Shear Cap., 3” x 3” x 3/8” – 4” x 4” x ¼” Angle Shear Cap., 55 Ton 1 1/16” thru 5/8” Punch Cap. Haeger HP6-C 6 Ton x 18” Hardware Insertion Press s/n 2092 w/Tooling. Pexto mdl. 381D 36” x 22GA Hand Roll s/n 5768-1-96 w/ 2” Rolls, Stand. Whitney Kick Punch w/ 24” Throat. Bridgeport Vertical Mill s/n 195959 w/ Heidenhain DRO, 2Hp Motor 60-4200 Dial Change RPM, Power Feed, 9” x 42” Table. Bridgeport Vertical Mill w/ Mitutoyo DRO, 1Hp Motor, 80-2720 RPM, 8-Speeds, 9” x 42” Table. Bridgeport Vertical Mill s/n 222180 w/ 1Hp Motor, 80-2720 RPM, 8-Speeds, Chrome Ways, Power Feed, Trava-Dials, 9” x 48” Table. Bridgeport Vertical Mill w/ 1Hp Motor, 80-2720 RPM, 8-Speeds, Power Feed, Trava-Dial, 9” x 42” Table. Trump 1340GH 13” x 40” Geared Head Gap Bed Lathe s/n 21871605 w/ 54-2000 RPM, Inch/mm Threading, Tailstock, Steady Rest, Aloris Tool Post, 5C Collet Closer, 8” 4-Jaw and 3-Jaw Chucks, Coolant. Timesavers mdl. 137-1 HPM/75 36” Belt Grainer s/n 22490M w/ 36” Belt Feed, Cyclone Style Dust Collector. Progress Machine 6” Stroke Sander w/ Custom Hydraulic Scissor Table Lift, 30” x 67” Table. K.O. Lee mdl. S612HSML 6” x 12” Surface Grinder s/n 11985-568 w/ Magnetic Chuck. Harig 6” x 12” Surface Grinder. Kalamazoo 6” Pedestal Belt Sander. (2) Kalamazoo 1” Belt Sanders. Unipunch Punch and Die Grinder. Lincoln Square Wave TIG 275 Arc Welding Power Source s/n U1000700257 w/ Lincoln Cooling System. Esab Migmaster 250 MIG Welding Power Source s/n MA-1743004. Lincoln Power MIG 200 MIG Welding Power Source s/n M1030120423. Stryco Type D4-24-30 30kVA Spot Welder s/n 24179 w/ 24” Throat. Thermal Dynamics Cutmaster 38 Plasma Cutting System. 5’ x 10’ Welding Table. 36” x 72” Welding Table.